= Do you want a snack? = Sakini ofuro ni haitte ii? = Can I go ahead and take a bath? They offered us their “paws” as soon as they found out we were looking for guest teachers. This is the picture that they sent me on Twitter. = Oshieru koto ga dekiru kana? = We wonder if we will be able to teach you. Great! We just learned the suffix, かな ( = kana) in our previous lesson. = [Literally–>] We are so busy and we even need to borrow cats’ paws. We use this expression when we are very busy and are desperate for help. = Konnichiwa, hajimemashita! Kitchu to Salvador desu. = Hello, nice to meet you! We are Kitchu and Salvador. = Maggie Sensei wa yoku neko wo okkaketa to kiite imaseu ga kyou wa sonna koto wa wasurete ganbatte mina ni nihongo wo oshiemasu. = Although we heard Maggie Sensei used to chase cats, we will try to forget about that and do our best to teach you Japanese today. Maggie told us that someone asked if the meaning of いいです ( = iidesu) could mean more than “good or nice”. So today we will teach you a deeper usage of いい ( = ii). Oh, sorry. We will switch languages. = Kore wa ii wain da. = This is a nice (or expensive) wine. = Kare wa ii hito da. = He is a nice person. = Maggie Senesi no saito wa ii saito da. = Maggie Sensei’s site is a good site. = Did you see “Frozen”? = Un, mita! Ii eiga dane. = Yes, I saw it. It’s a good movie! 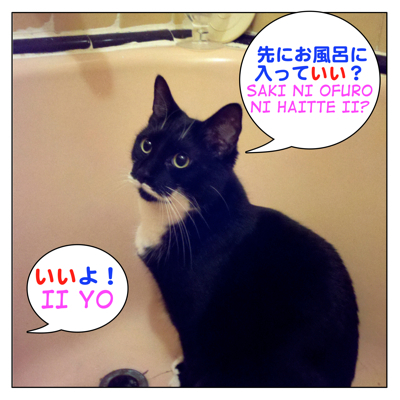 Did you know that the “Like” button on Facebook is called いいね ( = iine) in Japanese? = Nee, osushi tabeni ikanai? = Hey, do you wanna go eat sushi? = Natsu wa tsumetai men no hou ga ii. = I prefer cold noodles in the summer. 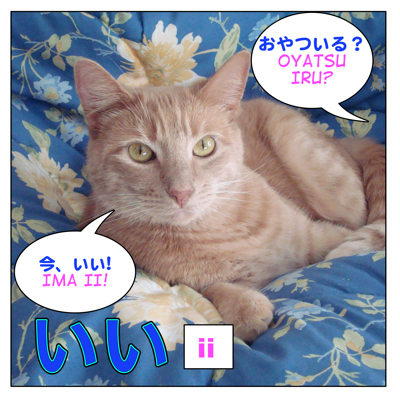 If you haven’t studied the difference between ～でいい ( = de ii) / ~がいい ( = ~ ga ii) , please go back and study this lesson. = Can I take a bath before you? = Koko ni aru kasa wo karite mo ii desu ka? = May I borrow this umbrella? = Goji ni nattara ie ni kaette mo ii desu. = You can go home at 5 o’clock. = Kore tabete mo ii? = Can I eat this? 4) When you you have / had something too much or enough and you don’t want it / them anymore. = Mou kanji no benkyou wa iidesu. = I have studied kanji too much. / I have had enough with Kanji. = Mou osake wa iidesu. = Watashi wa mou iikara kore tabechatte iiyo. = I had enough so you can finish eating this. = Ren-ai wa shibaraku ii desu. = I have had enough of love for a while. Let’s see the picture above again. ＝Maggie mo issho ni sanpo ni ku? = Do you want to go for a walk with us, Maggie? = Watashi wa ii…Hitori de iku kara. = No thank you! (No I am good) I will go there alone. = Ten-in : Kochira atatamemashouka? = Shop clerk : Would you like us to heat it up (in the microwave oven)? Customer = No, thank you. = Ten-in : Fukuro ni iremashou ka? = Shop clerk : Would like us to put this in a plastic bag? = Kyaku : Ii desu. = Customer : No, thank you. So this いいです( = iidesu) means 温めなくていいです。( = Atatamenakute iidesu.) You don’t need to heat it up. . / 袋はいらないです。( = fukuro wa iranai desu.) I don’t need a bag. Note: Hmmm I know some of you think, this is getting confusing. = Kochira, atatamete mo iidesu ka? = May I heat this up (in a microwave oven)? = Fukuro ni oire shite mo ii desu ka? = May I put this in a plastic bag? if you want them to do it. = Kore sutete mo ii? = Can I throw this away? = Kore sutenakute mo ii? = I don’t need to throw this away? = No you don’t have to. Related lesson : How to answer to negative questions in Japanese. はい and いいえ ( = hai and iie) Yes and No in Japanese. = Kanojo mo ii toshi ni nattane. = She has reached a nice age. We also use it sarcastically referring an adult who does silly things for their age. = Iitoshi wo shite sonna kotomo wakaranai no? = You are old enough to know better. = I want to be a good adult (in future). = Ii otona ga chiisai ko no oyatsu wo toru nante mittomonai! = Shame on you! A grow-up taking away a snack from a little kid! = You are so full of yourself. When you complain about someone who is very selfish or express your envious feeling towards people who can do what they like sarcastically. = Shigoto mo sezu ni asonde bakari nante ii gomibun dane. = What a lucky life you have! (You are so selfish) just playing around without working. = Anna yowai chiimu ni makeru nante iizama da. = It’s pathetic that they lost against such a weak team. = Tsugou no ii jikan wa nanji desuka? = What time is convenient for you? = It is getting late so I have to go home now. 7) It is sometimes used to emphasize a negative word. = Netto ni kazoku no waruguchi wo kakunante ii hajisarashida. = It is disgraceful to write bad things about your own family. = Joushi ga uriage wo agetai nowa wakaru ga zutto zangyou tsuzuki de ii meiwaku da. = I understand our boss wants to boost sales, but it is so annoying to be constantly working overtime. = Ano okyaku wa tenshu no ii kamo ni natteiru. = That customer is an easy target for the shop owner. = Dare ka ii hito inai? = Do you know any good man/woman (to date)? = Karemo ii hito mitsukenaito. = He should find a nice girlfriend. = Maggie ni mo ii hito ga dekitarashii. = I heard Maggie has a nice boyfriend. = Ano futari wa ii nakada. It also means a good lesson to learn. = Konkai no koto wa kare ni totte ii kusuri ni natta hazuda. = He learned his lesson. = Salvaror Sensei to Kitchu Sensei arigatou! = Minna, ippai benkyou shitakara mou kyou wa nihongo no benkyou wa ii? I wonder where you heard it…. We only hear it in old Japanese. Ex. 今、やらなくてなんとする= 今、やらなくてどうする！ = We have to do it now! Also なんだと ＝なんだって (depending on context) which means “What did you say?”. It’s often used in アニメ. I don’t think なんとする is 文語 (classical Japanese), because in classical Japanese there’s no する in 終止形 but す. This would change the form to なんとす （＝ なむとす） which means ～てしまおうとする or ～てしまいそうだ. I think なんとする might be some kind of dialect, and it could mean 「どうする（んだよ）」. I bet many Japanese people would say this famous Samurai drama line when they hear this word. But it sounds very dramatic and corny. and since it is “what”, you think it’s なに／なん? = I managed to a village following the path in the dark. = Omoi nimotsu wo motte yatto ie ni tadori tsuita. = I finally got home carrying a heavy bag. = Kitsune no ashiato wo tadotat. = I followed a footstep of a fox. Feel free to write an example sentence. I can check it. Wooow… To think ‘good’ can be used in so many ways @. @… Thank you very much for this lesson, it helped me with Japanese subtitles when I don’t understand why on earth they would put an ‘いい’ seemingly out of nowhere. Speaking of which, is Japanese multimedia usually subtitled? I can’t find any sources of Japanese audio/Japanese subtitled shows or dramas (since I don’t have access to Japanese TV)and when I do find a Japanese movie on my local TV (I’m from Malaysia), they usually have English subtitles instead. Any tips? Yes, いい has many ways of using. It may be hard to find movies or TV dramas with Japanese subtitles but many talk shows have a part of subtitles. You can find them on Youtube. Ex. 質問していい（ですか）？ ＝ Can I ask you a question? Ex. 食べてもいい（ですか）？= Can I eat? Ex. 歌ってもいい（ですか）？ = Can I sing?